Dr. Bailey is the Director of the University of Wisconsin Carbone Cancer Center and a professor of Medicine at the UW School of Medicine and Public Health. 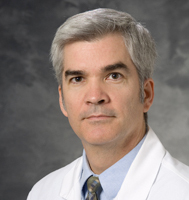 Dr. Bailey's clinical expertise is in sarcomas and gynecologic malignancies and his research focus is in anti-cancer drug development, especially chemoprevention, and research network development. He graduated from medical school at the University of North Dakota and completed his internship and residency at Southwestern Michigan Area Health Education Center in Kalamazoo. He completed a fellowship in Medical Oncology at the University of Wisconsin and completed a Research Fellowship at the UW Carbone Cancer Center. Dr. Bailey is board certified in Internal Medicine and Medical Oncology. Dr. Bailey is the principal investigator of the UW Chemoprevention Consortium, an NCI-sponsored research network of Universities that conduct Phase I and II clinical trials for chemopreventive agents. Dr. Bailey also leads the UWCCC Chemoprevention Scientific Program and Chemoprevention Disease Orientated Work Group. He is the senior leader and advisory committee chair for the Wisconsin Network for Health Research, a collaborative effort across the state to promote greater inter-institutional cooperation in research and to move research results to the bedside more efficiently and effectively. Dr. Bailey was appointed to the national committee which reviews all NCI-designated Cancer Centers in 2011. Dr. Bailey is the University's expert on drug and nutrient development for the prevention or treatment of cancer and a national expert on chemoprevention. Cancer chemoprevention is the use of natural, synthetic (made in a laboratory) or biologic (form a living source) substances to reverse, suppress or prevent the development of cancer. He is internationally recognized as an expert in chemoprevention and sarcoma and has lectured both in the United States and abroad. Dr. Bailey has directed or participated in more than 100 cancer clinical trials examining agents for prevention or treatment of cancer. Dr. Bailey is involved in the research of new clinical agents for the prevention and treatment of cancer. He leads the Etiology and Chemoprevention Program of the UW Carbone Cancer Center - which examines the causes of cancer and then translates this knowledge to develop and evaluate drugs, vitamins, or other agents to try to reduce the risk of or delay the development of cancer. He is the principal investigator of the Chemoprevention Consortium - a consortium of five national institutions to conduct multiple Phase I and II clinical trials for chemopreventive agents.